To Scotty: done! it worked! Was called this morning to rescue the new technician. Her computer’s Internet connection wasn’t working. Usually I’m answering that I can’t help with machines operating under Windows, my last in depth relation being Windows NT. But nowadays I’m building the lab’s intranet and blogs and stuff like that, so I plan to abuse as many beta testers as possible, so I gave it a try. 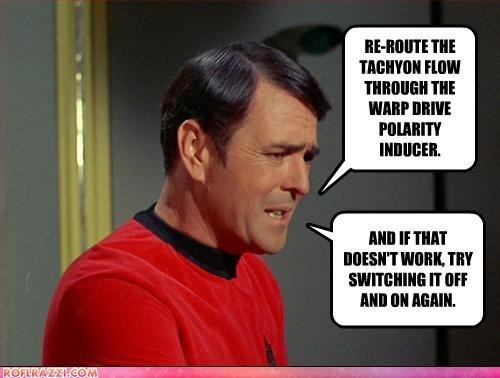 Re-routing the tachyon flow through the warp drive polarity inducer didn’t worked, neither trying to rebuild the connexion, or find out what was wrong using the diagnostics. The guy who wrote the messages must be a Star Trek fan and the last proposition was to switch off and on the Ethernet hub. Done that and as Steve says : Boom! The connexion was back instantly. 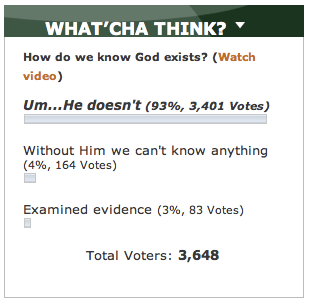 My reputation as the-guy-who-makes-computers-do-their-job (even those running WindowsXP) is supported by more and more evidence. Go and do your bit, for the fun of it.